The term hippocampal formation typically refers to the dentate gyrus, the hippocampus proper (i.e., cornu ammonis), and the subicular cortex. A hippocampal formation is located in the temporal lobe of each cerebral cortex, medial to the inferior horn of the lateral ventricle. Hippocampus means seahorse in Greek. Each hippocampus looks like a seahorse due to the way it is folded during development. Cross-section of hippocampus and its similarity to the seahorse. Development of the hippocampus in cross-section. The hippocampus is also called cornu ammonis. Ammon was an Egyptian god, near whose temple ammonia or the salt of Ammon was prepared. The hippocampus is also called Ammon’s Horn because the two hippocampi bend around in the form of the horns of a ram. Schematic drawing showing the major and surrounding structures of the limbic system. Structure of the hippocampus, uncus, crua, fornix, anterior commissure, precommissural fornix, postcommissural fornix, and columns. The fornix is a “C” shaped tract (in sagittal section). The fornix begins as the bundle of fibers called the alveus. The alveus is white matter consisting of mylinated afferents and efferents. As the fibers of the alveus travel posteriorly, they aggregate medially to form the fimbria of the fornix. Fimbria means fringe and in this case it is the fringe of the hippocampus. The fimbria looks like a thick rubber band. The fimbria of each hippocampus thickens as it moves posteriorly and eventually splits off from the hippocampus forming the crua or “legs” (singular—crus) of each hippocampus. The two crua come together and form the hippocampal commissure. The hippocampal commissure provides one of two major paths whereby the hippocampi communicate with each other. After the hippocampal commissure the single fiber bundle is properly referred to as the fornix. The fornix continues in an arc to the anterior commissure. The split just before the anterior commissure is called the precommissural fornix and this branch goes to the septal nuclei, the ventral striatum, and the cingulate cortex. Some fibers from the fornix also pass through the anterior commissure to the contralateral hippocampus. This is the second of the two major paths by which the hippocampi communicate with each other. The split after the anterior commissure is called the postcommissural fornix and this branch goes to the mammillary bodies of the hypothalamus and the anterior nuclei of the thalamus. Outputs or efferents from the hippocampus pass directly from the subiculum to the entorhinal cortex and amygdala or through the fornix to a variety of anterior structures. Click on any of the labels to see its location identified by a green haze. It is important to remember that afferents and efferents of the hippocampus are bundled together in the same paths. Thus, by knowing the output paths, for example, you will also know the input paths, or vice versa. Two major pathways into and out of the hippocampus are the fornix and entorhinal cortex (via the cingulate cortex). The precommissural branch of the fornix connects to the septal nuclei, preoptic nuclei, ventral striatum, orbital cortex and anterior cingulate cortex. The postcommissural branch of the fornix connects to the anterior nucleus of the thalamus and the mammillary bodies of the hypothalamus. The mammillary bodies are destroyed in Korsakoff’s syndrome as the result of alcoholism and thiamine deficiency. Patients with Korsakoff’s syndrome have profound difficulty forming new memories. Because the mammillothalamic tract also goes to the anterior thalamic nucleus, the hippocampus can affect the thalamus indirectly as well as directly. The anterior thalamic nuclei in turn connect to the cingulate cortex. The cingulate cortex projects back to the entorhinal cortex of parahippocampal gyrus, completing a “great” loop called the Papez circuit. The Papez circuit like many other areas of the limbic system is involved in learning and memory, emotion, and social behavior, and was originally thought (by James Papez) to the anatomical substrate of emotional experience. The amygdala, along with neocortical areas, are now known to be centrally involved in emotional experience. Its connections to the original Papez circuit are shown in the next figure and the amygdala and emotion are discussed more thoroughly in the next section. The original circuit proposed by Papez is shown by thick lines and more recent connections are shown by thin lines. Note the reciprocal connections between the hippocampal formation and the association cortex, and the inclusion of the amygdala and prefrontal cortex. The hippocampus has direct connections to the entorhinal cortex (via the subiculum) and the amygdala. These structures connect to many other areas of the brain. The entorhinal cortex projects to the cingulate cortex. Therefore, the hippocampus can affect the cingulate cortex through the anterior thalamic nucleus or the entorhinal cortex. The cingulate cortex, in turn, projects to the temporal lobe cortex, orbital cortex, and olfactory bulb. Thus, all of these areas can be influenced by the hippocampus. Press the play button to see original Papez circuit. 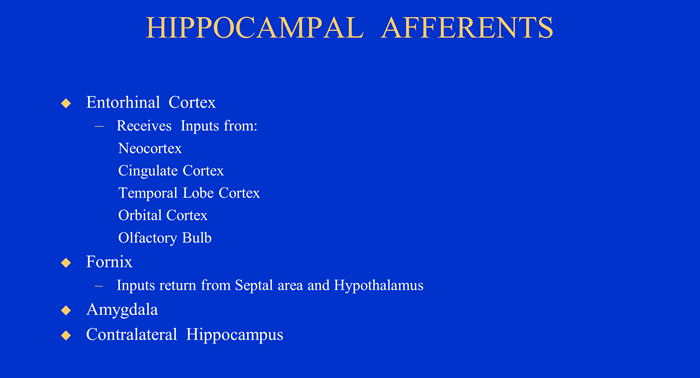 Inputs or afferents to the hippocampus. Major inputs come from the entorhinal cortex, which in turn communicate inputs from the cingulate, temporal, orbital, and olfactory cortices and amygdala to the hippocampus. The input paths are just the reverse of the output paths. The entorhinal cortex is a major source of inputs to the hippocampus. In addition, the cingulate cortex, temporal lobe cortex, amygdala, orbital cortex, and olfactory bulb all have inputs to the hippocampus via the entorhinal cortex. The hippocampus receives inputs via the precommissural branch of the fornix from the nucleus basalis of Meynert, which is a portion of the substantia innominata and which in turn is a portion of the septal nuclei. Also the hippocampus receives inputs via the postcommissural branch of the fornix inputs from the mammillary bodies of the hypothalamus. Structure of the hippocampus. The medial section showing the right hemisphere. The line shows location of a cut through the left hemisphere. A blowup of the cut surface through the hippocampus shows the relationship of the hippocampal formation to the entorhinal and parahippocampal cortices. The box diagram shows output and input pathways through the hippocampus. The hippocampus proper and the dentate gyrus processes information that passes through the hippocampus. These two structures, the hippocampus proper and the dentate gyrus, form two interlocking “Cs.” The term dentate gyrus comes from the beaded or toothed appearance of this structure resulting from the many small blood vessels from subarachnoid space that penetrate the dentate gyrus. The hippocampus and dentate gyrus are actually cortex, but it is 3-layered cortex rather than 6-layered cortex as in the neocortex. Because of the smaller number of layers and their location between the neocortex and diencephalon, these cortices have been called paleocortex, which means old cortex or archicortex which means ancient cortex. These terms are misleading because they give the false impression that these cortices are antiquated remnants left over as the brain evolved and became more complex. They are brain regions that have actually continued to develop structurally and functionally throughout phylogeny. The hippocampus and dentate gyrus, like the neocortex, have a superficial molecular layer and a deep polymorphic layer. But because these structures are "inside-out" cortex, the molecular layer is on the inside and the polymorphic layer is on the outside. The middle layer of the hippocampus proper is a pyramidal cell layer. The middle layer of the dentate gyrus is a granular layer. The molecular layer of the hippocampus proper faces the dentate gyrus. The area of the hippocampus proper that is capped by the dentate gyrus is referred to as CA3 (CA for cornu ammonis). The polymorphic layer is the alveus and is equivalent to the white matter of the neocortex. The subiculum is the transition layer from the hippocampus to the parahippocampal gyrus and changes gradually from three to six layers. The hippocampus coordinates information from a variety of sources. A major flow of information through the hippocampus is a one-way circuit. Some inputs to the hippocampus (perforant pathway) from the entorhinal cortex pass through to the dentate gyrus. From the dentate gyrus connections are made to CA3 of the hippocampus proper via mossy fibers and to CA1 via Schaffer collaterals. From these two CA fields information then passes through the subiculum entering the alveus, fimbria, and fornix and then to other areas of the brain. Slice through the hippocampal formation showing the location of CA1 and CA3 cells and the Dentate gyrus. Information flows into and through the hippocampus by three principal pathways: 1. the perforant pathway from the entorhinal cortex to granule cells of the dentate gyrus; 2. the mossy fiber pathway from the granule cell of the dentate gyrus to the pyramidal cells of the CA3 region of the hippocampus; and 3. the Schaffer collateral pathway from the CA3 region of the hippocampus to the CA1 region of the hippocampus. Another view of the three-cell circuit of the hippocampal formation. Identification of an epileptic seizure can be made through EEG (Electroencephalogram) recordings. The EEG records from hundreds of thousands of neurons from scalp electrodes. A few electrodes are placed on the scalp. Voltage differences are recorded relative to a reference electrode some distance from the site. The pyramidal cells of the middle layer of the hippocampus proper are the major input of the EEG recording. The pyramidal cells have specialized structures for input called dendritic spines, little spines that are attached to the dendritic shafts. The pyramidal cells are glutamate excitatory neurons and are the major neurons that project to the cerebral cortex and are the major driving force of temporal lobe epilepsy. Schematic diagram of the relationship between a pyramidal neuron, a basket cell, and the resulting recurrent inhibition. The dendrites are parallel to one another resulting in summation of extracellular current flow and hyper-excitability seen in epilepsy. The pyramidal dendrites are perpendicular to the cortical surface resulting in different layers of cortex impinging at different points along the dendritic tree. The pyramidal dendrites contain dendritic spines that amplify currents (inputs) so that distant synaptic sites can more easily generate action potentials. The pyramidal cells (dendrites) receive inputs from basket cells that regulate excitability of the pyramidal cells through recurrent inhibition. Pyramidal cells would be in a continuous bursting firing mode if there were no basket cells. The diagram shows a cartoon pyramidal cell, axon, excitatory collateral to basket cell, basket cell, and inhibitory connection to pyramidal cell. This simple circuit is what is called recurrent inhibition. This is a general feature of nervous system, a collateral to a special cell—the basket cell. The pyramidal cell excites the basket cell. Excitation of the basket cell in turn produces negative feedback or inhibition of the pyramidal cell. That is, action of the pyramidal cell acts through the basket cell to regulate its own activity. The neurotransmitter of the basket cell is GABA or gamma-aminobutyric acid, typical of most inhibitory neurons. Epilepsy is a synchronous discharge of pyramidal cells. This synchronous discharge produces stereotyped and involuntary jerking movements, loss of awareness, and in the most extreme case convulsions and loss of consciousness. Next to stroke, epilepsy is the most common neurological disease. Possibly as much as 1% of the population is affected at one time or the other. Focal or partial epilepsy is restricted to a particular brain region. But an epileptic attack can begin as a focal attack and spread to other cortical areas and become a generalized seizure. For an epileptic seizure hundreds of thousands of neurons must be firing in synchrony. The way this happens is a breakdown in postsynaptic inhibition. The importance of inhibition and the role of the basket cell can be demonstrated by disabling the connection between the basket cell and the pyramidal cell. Picrotoxin, a GABA antagonist, will disable this junction and results in a cascade of excitation and the synchronous activity of an epileptic seizure. Also, examination of sections through the hippocampus in patients with temporal lobe epilepsy has shown a loss of cells in the plexus surrounding pyramidal cells. This is where the basket cells are typically found. Thus, there is a loss of the inhibitory input that is normally found there. The brake on the system, that is control of the burst firing of pyramidal cells, has been removed when the basket cells have been removed. Long-term potentiation (or LTP) was discovered by efforts to determine how the hippocampus might determine memory. Patient H.M. had just recently demonstrated that the hippocampus was critical in lying down new memories. Researchers found that neural activity can modify synaptic strength in certain areas of the hippocampus. This modified synaptic strength (LTP) may be a storage mechanism for memory. For more information on LTP and how it is involved in memory formation, see the chapter on Learning and Memory. The postcommissural fornix projects to which structure? A. Substantia innominata. This answer is INCORRECT. The precommissural branch goes to the septal nuclei and the substantia innominata. B. Mammillary bodies This answer is CORRECT! It is the postcommissural branch of the fornix that goes to the mammillary bodies. C. Ventromedial nuclei of the hypothalamus This answer is INCORRECT. The postcommissural branch of the stria terminalis goes to the ventromedial nuclei of the hypothalamus. D. Nucleus basalis of Meynert This answer is INCORRECT. The precommissural branch goes to the septal nuclei and the nucleus basalis of Meynert. E. Anterior cingulate cortex. This answer is INCORRECT. The anterior cingulate cortex is not a direct destination of the fornix. Which structure is NOT part of the Papez circuit? A. Anterior nucleus of the thalamus This answer is INCORRECT. The anterior nucleus of the thalamus is a major component of the original Papez circuit. B. Ventral nucleus of the thalamus This answer is CORRECT! The ventral nucleus of the thalamus is not part of the Papez circuit. C. Cingulate gyrus This answer is INCORRECT. The cingulate gyrus is a major component of the original Papez circuit. D. Hippocampus This answer is INCORRECT. The hippocampus is a major component of the original Papez circuit. E. Mammillary bodies This answer is INCORRECT. The mammillary bodies are a major component of the original Papez circuit.